Challenging puzzle game of reactor engineering. Is there a better alternative to SpaceChem? Is SpaceChem really the best app in Strategy and War category? Will SpaceChem work good on macOS 10.13.4? 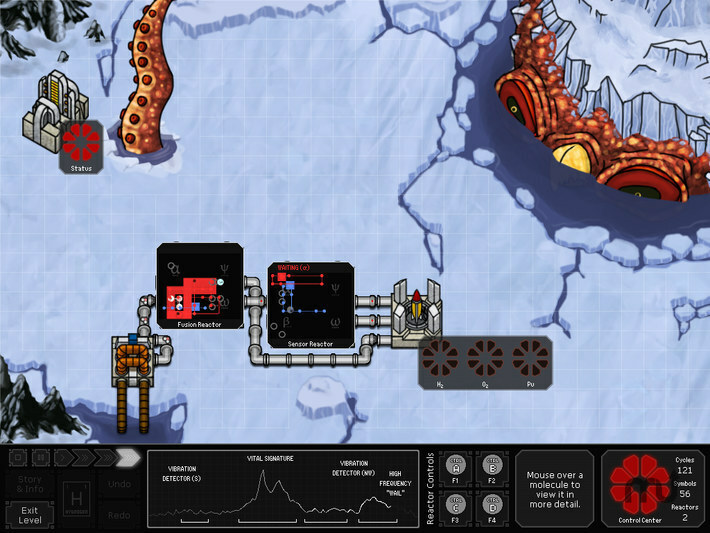 SpaceChem is a problem-solving puzzle game centered on the lofty daily travails of a SpaceChem Reactor Engineer. SpaceChem needs a review. Be the first to review this app and get the discussion started! SpaceChem needs a rating. Be the first to rate this app and get the discussion started! SpaceChem is an intriguing, "problem-solving centric" puzzle game by Zachtronics Industries that combines the logic of computer programming with the scientific domain of chemistry, set in an original science fiction universe. Players build machines using mechanics similar to visual programming that assemble and transform chemical compounds. Players later connect those machines together to form complex pipelines, and ultimately construct special pipelines to fight back against space-monsters that threaten humanity. In addition to being challenging and mentally stimulating, it's been described as "one of the year's best indie games" by Rock, Paper, Shotgun, a leading PC gaming website.